Equality and impartial treatment, constant service, continuous improvement, efficiency and effectiveness, kindness and clarity are the base of Lumenflon’s quality policy and its organizational set-up. 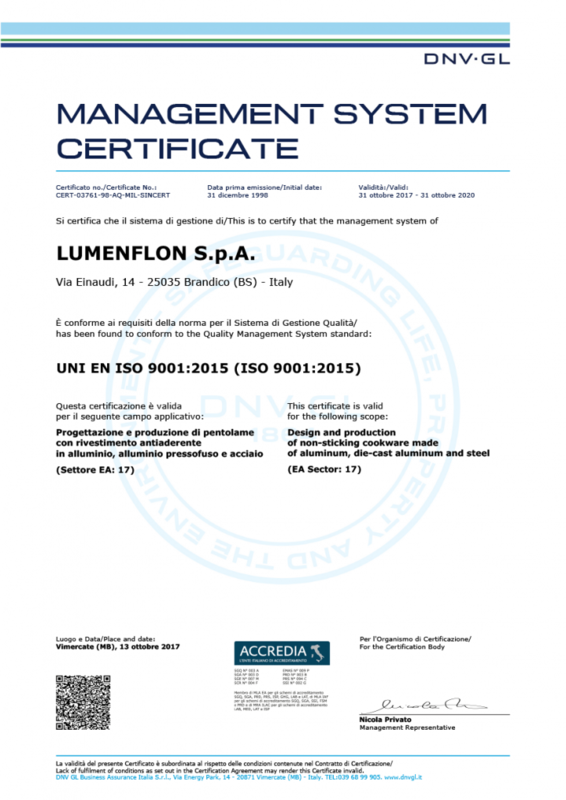 In order to apply concretely above mentioned principles, risks and opportunities, connected to the process management, are carefully and periodically evaluated and above all a Quality Management System has been implemented and maintained in compliance with the requirements of the international standard ISO 9001: 2015. Care and Attention to the customer are the strenght of our staff and this enables us to be a great partner for our client’s development. The professional growth of our staff is the result of continuous training: the customer can take advantage of cutting-edge solutions and appropriate and competent assistance. improvement of organizational effectiveness, compliing with the principles expressed in the Quality Policy. Above mentioned actions are considered important purposes by the Quality Assurance Manager. They are periodically monitored by the engagement of the processes managers and evaluated by the Management during the re-examination of the Quality Management System. This Policy and the business goals in it involved, are assessed annually to ascertain their constant validity.